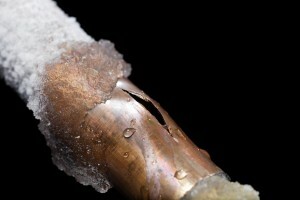 Frozen pipes can cause a tremendous amount of damage to your home or business. Just one burst pipe can do tens of thousands of dollars of damage to ceilings, walls, carpeting and furnishings. Frozen pipes are most common in older homes or in locations where pipes are exposed, on outside walls, in crawlspaces and uninsulated attics. If your pipes have burst, or have thawed and not burst, you need to arrange for plumbing repair to replace the burst pipes, and possibly even pipes that didn’t burst, as freezing can weaken the pipe. Call First Class Plumbing for a quick response. Keep reading for information on how to avoid having to call us for frozen pipes. Sealing gaps where cold air may come in contact with your pipes, such as near dryer vents, cable entry, etc. Disconnect hoses from outside hose bibs before freezing temperatures are expected. Open under sink cabinets and allow a trickle of both hot and cold water running in taps located on an outside wall. If a house, cabin or other location will be vacant during the winter, turn off the water main and leave the heat set to no lower than 60 degrees to keep the pipes from freezing. If you turn on a faucet during frigid temperatures and there is no flow of water, turn off the water main but leave the faucets open. If pipes are exposed, you may be able to thaw them yourselves using a hair dryer. If the frozen pipes are behind a wall, call First Class Plumbing for help.